The Africa Diaspora Forum, in partnership with the Community Media for Development (CMFD) Productions, and with the support of the Foundation for Human Rights, successfully organised the Migrant Rights are Human Rights pan African celebration held at the Yeoville Recreation Centre on the 21st of May 2011. The Pan-African concert brought together more than 600 people, representing the many cultures and colours of Africa , in the spirit of celebrating African diversity and the human rights of migrants. The pan-African celebration was held under the motto: “Many faces, One Africa”. Central also to the event was the commemoration of the 62 Africans who died, together with those who were injured and displaced during the xenophobic attacks of May 2008 in South Africa. The main objectiveof the Concert was to try and foster a spirit of humanity and celebrate the Rights of Migrants by bringing Migrants and South Africans together. In that way, the Concert sought to demonstrate that Migrants and South Africans can live together in a spirit of brotherly and sisterly love and harmony. The concert was a part of the Africa Diaspora Forum’s ongoing work to help build an integrated society, free of xenophobia. ADF is a federation of African Migrants and Migrant Associations which is inclusive of South Africans. Its mission is to facilitate relationships between all Africans living in South Africa and consolidate a shared feeling of belonging in Africa. The recent pan-African celebration built on ADF's previously successful projects such as the Africa Week Festival and Many Faced Audience Africa Heritage Indaba held in Yeoville in May and September 2010 respectively. These events also aimed to celebrate the diverse heritage of all people in South Africa and Africa. For the African Heritage Indaba, ADF brought together Bra Hugh Masekela, Police Minister Nathi Mthethwa, UNHCR, Elinor Sisulu, community leaders, NGOs, CBOs, FBOs and cultural performers, also at the Yeoville recreation Centre. 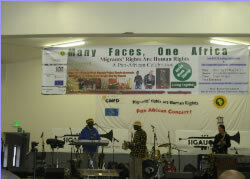 The Many Faces, One Africa; Migrants Rights are Human Rights celebration continued in this tradition, thereby contributing to ntinued and sustained advocacy around migrants rights as human rights. The people, who participated at the event, as expected, were migrants from a diversity of African countries and South Africans. 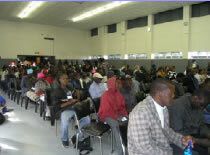 Migrants sheltered at the Central Methodist Church in Johannesburg, who were invited, also thronged the event. The event therefore became a platform demonstrating the possibilities and potentialities of integration of South Africans and non-South Africans, which is so much desirable in the creation of healthy communities in South Africa. Based on the agreement between FHR and ADF, a number of key activities were successfully completed. The day beginning with an opening and welcome and the speech by ADF Chairperson, Marc Gbaffou. Immediately after, there was a candle lighting and prayer ceremony for commemoration of victims of xenophobic violence led by Bishop Owen McGregor of the African Council of Churches. The African Council of Churches was strategically chosen to lead the commemoration because it is an inclusive faith-based organisation, which was important to the spirit of togetherness. The afternoon concert featured the pan-African songs of the Mozambican-based group Sigauque Project; Congolese musicians Marco Don K 1er and Blancho du Pouvoir; West and South African reggae from Mazola (Lion Silver Dread); dance group Blue Boy Pantsula; and the South African classical sounds of Seeds of Lights. All of the groups featured were briefed about the purpose of the concert prior to the event. The concert had a number of key achievements and messages. First of all, the diversity of the music itself is a way for people to share their culture, and by doing so, this helps to create a greater interest and awareness of fellow Africans. As people dance and sing together, they can appreciate African diversity itself. At the same time, many of the artists themselves spoke about or sang about human rights issues. Sigauque Project has several songs related to human rights, included songs about xenophobia, human trafficking, and women’s’ rights – all important issues in the migrant community. Lastly, the concert was a way of raising awareness among artists themselves, who may in the future consider including such messages in their work. “Our message is simple, what we are saying is that migrants are part of us, we need to respect each other. Ubuntu, the spirit of African togetherness, has no borders.” - Gaone Dixon, project support officer from IOM. The International Organisation for Migration was on hand to tell people about their counter xenophobia campaign, One Movement, as well as distribute stickers, wrist bands, and other materials. Amnesty International - on hand to share information about their human rights work. Sonke gender Justice - Distributing information about their counter xenophobia work and men as partners. As part of docuemntaing the initiative and furthering the message, a radio journalist was tasked with creating a musical documentary of the day. Over the course of the day, the journalist created a significant amount of audio. This included interviews with musicians, rights-based organisations who had information on display, and people attending the event. This will provide a powerful media piece about music and culture, as well as highlight practical information about xenophobia and migrant rights. This audio report will be distributed to radio stations and be available for people to listen to online. In this way the messages reach further than the event. While not part of the original funding proposal, and not using FHR funds, ADF mobilised other funds, initiative and creativity to build on the days activities. 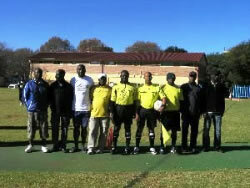 Local soccer players and sports fans representing four countries - South Africa, Cameroon, Nigeria, and Ghana – met on the pitch immediately preceding the event at the Yeoville Recreation centre. This event added to the day, as it brought together teams from the four countries in friendly competition, and also provided another venue for passing along the human rights messages. It also successfully helped to mobilise people for the event, as people cane out to cheer on their country teams. 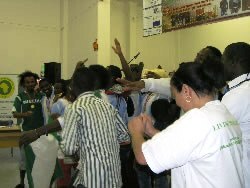 The first and second place teams, Nigeria and South Africa, were awarded during the main event, at 14:00. A very small activity that had no costs at all, children were invited to draw different articles found in the Universal Declaration of Human Rights. This helped for children to be entertained and occupied while their parents waited for the concert to begin. It also helps to introduce children at a very early age about the notion of “rights’ even if they are too young to understand what this means. 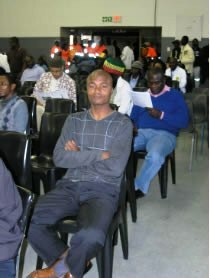 As expected, the event was able to attract many migrants and South Africans. In the planning phase, we had expected to have about 500 people participation in the event and we actually surpassed that figure, attracting more than 600 people. As the feedback we got in out after concert meeting held to review the event demonstrate, this objective of fostering the social integration of migrants and South Africans was clearly met. One South African lady had this to say after the concert: "This concert has made me feel proud to be African". Participants who came from the Methodist church, who are mainly Zimbabwean migrants, indicated that they were very happy and felt important to be part of the event because most of the time they are sidelined in other events relating to migrants. ADF extends its gratitude to all its partners, including Foundation for Human Rights, the Community Media for Development, European Union, NESS Consulting, AVBOB and South African Department of Justice. ADF looks forward to sustenance of this partnership and to future collaborations on projects.